Welcome! I have another fun Kindergarten Printable for you today. I had a request to take my Number Order Puzzles and kick them up a notch, so I did! Introducing the new and improved Kindergarten Number Order Puzzles! These puzzles practice number order, counting, and recognition skills for numbers 1-100. I also added in puzzles to help work on skip counting by 2s, 5s, and 10s. The puzzles include counting 2-50, 5-50, and 10-200. How do you use these fun puzzles? I suggest printing them on cardstock, then laminating for durability. Next cut out each number strip vertically along the lines to separate the numbers strips. Next mix up the number strips and have your student practice putting the numbers in the correct numerical order. If they do it correctly the picture should look right. If they’ve mixed up a number, the picture will be off, so it will help them to self-correct. 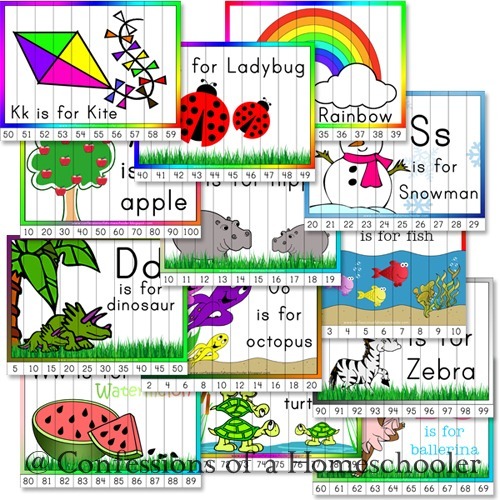 I hope you enjoy the Kindergarten Number Order Puzzles and that your students have fun learning their numbers! I love these just wish they were black & white more like a coloring sheet that they could color and cut, and would save printer ink. You always have awesome ideas. If you set your printer to “greyscale” it will prink black and white, and save color ink. These look like fun! I love how they use skip counting! Thank you so much for these!! I recently started homeschooling my preschooler who is learning to count to 20 so the hippo and fish puzzles are perfect. I recently started a home school blog and added a link to your clothes pin matching printables. You can view it here http://sjthomeschool.blogspot.com/2012/07/first-day-of-school.html I have a feeling we will be using a lot more of your ideas in the future. Thank you for such an amazing site. Thank you for taking the time to create these and share them. My kiddos love doing puzzles. We love these puzzles and now you’ve made them even more versatile! We like to print ours onto magnet paper. I place the puzzle on the fridge or dishwasher for the kids to do when I’m cooking. Thanks for making these!!!! I was SO excited to see you made them. They are going to be a big help this year. Waiting on my new laminator to print out them all. Thanks for all your freebies. Thanks for a great idea! My son is 2, and I am a former kindergarten teacher, but I am obsessed with trying to find the right curriculum/games/etc for him! Your site is absolutely amazing!! I am a k teacher. I love your ideas. And I appreciate your generous spirit to share with us. God bless you! Your kids sure are blessed.